Join us at Fluid Fun in Bristol on Saturday, April 13th for a Fishing Seminar with our area fishing experts! 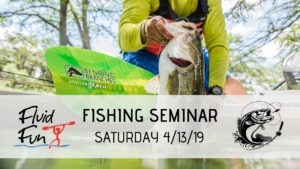 Hayden Miller, Native Watercraft Pro Staffer will be going over Boat Control while Kayak Fishing & Steve Hrynewycz, Jackson Kayak Regional Fishing Team Member will be covering rigging & organizing! Follow the event on Facebook for more details & updates.